For several years, I have been a member of the comic book site, Comic Vine, which is the largest comic wiki in the world and also hosts a variety of discussion forums. “Owie” is my username on the site. I don’t do anything different from anyone else on the site. 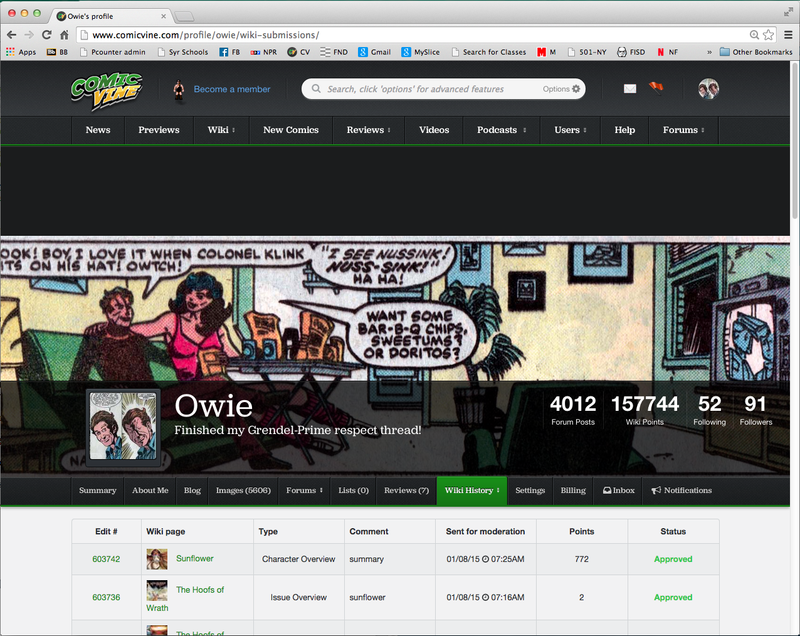 Comic Vine contains hundreds of thousands of wiki entries, including descriptions of individual issues, characters, and their creators. It is entirely written by comics fans worldwide, who volunteer their time out of a pure love for the medium. These wiki sections have strict guidelines, are written in intricate detail, and are aimed at creating a professional-style encyclopedia on comics. The site also has many forums. Contrary to the stereotype of online conversations, Comic Vine discussions are often highly intellectual and thoughtful, and there are large sections in which the users practice very evolved versions of debate and in-depth logical analysis. Owie, as an art project, exists solely to highlight this kind of activity as a worthwhile form of creative production. In essence, I think the everyday users’ activities on this site are an enjoyable form of creative production that contributes to our overall culture in a way that is just as legitimate as traditional forms of cultural production (the “arts”), such as visual art, theater criticism, advertising, crochet, etc. Of course, Owie doesn’t only exist as an art project; it’s also an honest expression of my interest as a sincere comics fan! It has been my goal to find ways to contribute to the site and become a useful and respected member. I think I’ve done a pretty good job at this and have been noted for my efforts in a variety of ways. I was nominated for the Debator Hall of Fame by other users (although I have not been voted in as a finalist); my posts have been selected by the staff for one of the Arguments of the Week for the Battle of the Week nine times, which is one of the most, if not the most, of any participants; I was an invited judge in a tournament; and I am approximately the 50th-highest wiki-writer on the wiki out of about 200,000 members, with 157,000+ wiki points. I have created over 250 battles on the site, which puts me among the most prolific battle creators, and I originated a particular kind of bracket battle that has been used by multiple other users. The threads that I created in 2014 alone brought in over 15,000 page views, with several individual threads having comparable numbers of views to staff articles. All together, Owie is one of my main projects and is an attempt to dig into the ways that normal people contribute to creative culture outside the art world. Here are the links to the Battles of the Week that my arguments were featured in. Scroll down until you see “Owie” in each article. Black Widow vs Talon. I argued for Black Widow, Talon won the user poll. Batman vs Snake-Eyes. I argued for Too Close to Call, Batman won the poll. Moon Knight vs Batwoman. I argued for Moon Knight, and he won the poll. Cyclops vs Ninjak. I argued for Too Close to Call, Cyclops won the poll. Green Arrow vs Black Widow. I argued for Green Arrow, and he won the poll. Green Arrow vs Elektra. I argued for Elektra, Green Arrow won the poll. Raphael vs Damian Wayne. I argued for Raphael, and he won the poll. Aquaman vs She-Hulk. I argued for Aquaman, and he won the poll.